Over the years, my faith has grown and it’s become something that I hold very close to my heart. While I’m not always able to actually attend church, I try to crack open the bible and dive deep into studying the Word every day. It’s personally something that keeps me grounded, calm and focused on my future – especially when things get rough. In the past, I had been a part of an incredible bible study group and I loved it! We met weekly to talk about Sunday’s sermon, we did bible studies together, watched biblical movies and had lots of potlucks (one of my favorite parts, while we’re being honest! 😉) I have also been a part of a bible study at work, which was the biggest blessing. Myself, my boss and two of my coworkers met at lunch to cover bible studies. It was so heart-warming to be able to share my faith in the workplace, and that’s something I’ll always cherish. I’ve also had bible studies with friends, and it’s been the greatest experience to share faith with close friends. While being a part of a group is a great way to dive deep into the Word, you don’t have to! I have found that doing my own solo bible studies and having quiet Jesus time every day to myself, is amazing too! 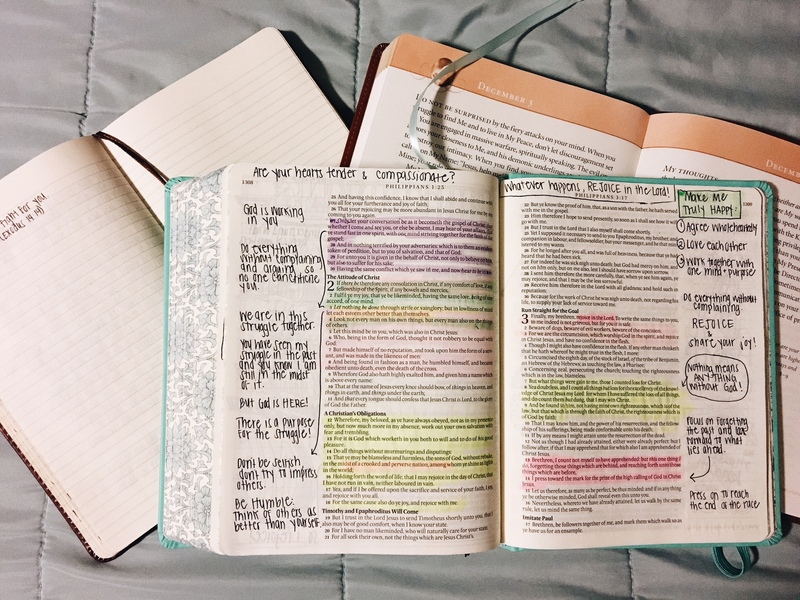 Here is everything I do to study the Bible on my own, I hope it helps you get started too! I have used the YouVersion Bible app for years. I was traveling and needed something that was easy to use, so I downloaded it. Little did I know, it would help open up the Bible for me in ways I never thought imaginable. You can either choose to study by Book, seasons (Christmas, Easter, etc), a life event you’re facing, or your current emotions/struggles. I’ll be posting a blog soon on the current Bible Studies I’m doing, but in the meantime I highly suggest you download it if you aren’t already using it. It’s so, so helpful. When I was living in Canada, my faith deepened and strengthened and that is all thanks to the incredible mentors in faith I had! I am thankful for my last relationship, because we both helped each other grow in our faith. Through him, I also joined an amazing church community that opened my eyes to what faith and religion means. I met so many people who have walked in their faith for so long, I listened to their stories, they prayed over me, and I learned so much about God and myself that I simply could not have learned on my own. Reach out to your church community, find a solid mentor to learn from, find someone who can show you God in a different light that makes sense to you. I should preface this with: Buy a bible you will actually understand. I use the NLT (New Living Translation) because it’s written in common english, so it’s easily relatable. But, if you’re fine with the King James Version, go for it! One of the many things I love about church is the worship music. It’s uplifting, motivating, calming, exhilarating – all at once. I’m the type of person who wants results, wants to get things done, and I don’t like wasting time or waiting around for things to happen. And I certainly don’t like waiting on other people to do something for me. The kicker? Christianity tells us to trust in God’s timing. So, this led to me to share this today. This is easily one of the hardest parts of being a Christian. Being patient and trusting that He knows what He is doing and He knows what is best for us. So how can you trust in His perfect timing when you’re impatient like me? 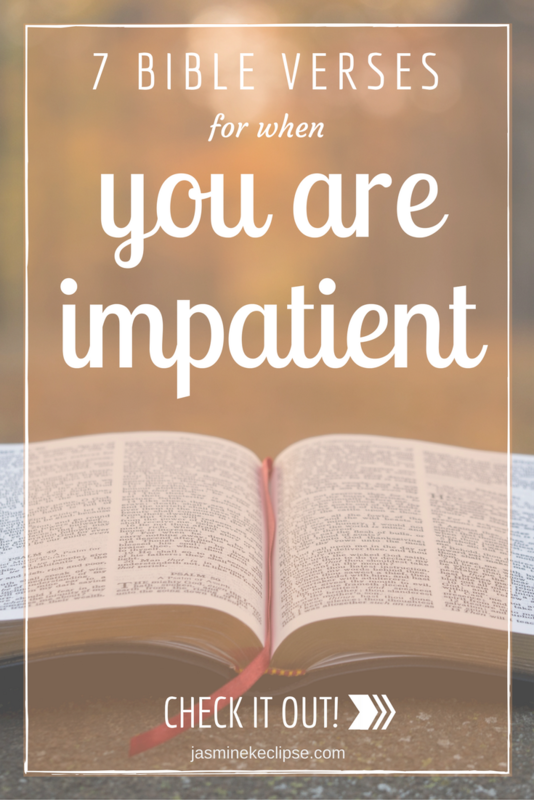 Well, I’ve gathered a few of my favorite verses that have helped me be more patient, trusting and faithful during times when I’d rather not be patient. I’ve been wanting to somehow incorporate my faith into this blog for a long time now. I touch on it here and there and I occasionally throw a few verses on Twitter now and again, but I want to go more in depth. So I thought: Why not add a section to my blog dedicated entirely to my faith? There’s so much I want to discuss and talk about and offer advice on, but I figured I should start with a little backstory on my journey through faith. So that’s exactly what this is! I was raised in a Christian home. God was mentioned. There was a cross on the wall. We went to church on the big days (Christmas, Easter, etc). I attended a religious school. But growing up, I never felt a true connection to God and faith. It was always there, but it wasn’t really there. When I went off to college, that’s when my faith really started to slip. And no, it wasn’t because of college life, parties, boys, staying up late, and faith not being the “cool” thing. That wasn’t it at all. During college, I went through some of the toughest times of my life. I lost a friend in a drunk driving accident, another drowned in a lake, another committed suicide, my grandfather was killed by a speeding driver, my stepmother lost her battle to cancer, and my uncle lost his battle to cancer, and I was also sexually assaulted toward the end of college. All of this left me questioning where God was and why He would allow these things to happen. I fell out of my faith. I didn’t completely stop believing, but I just fell away from it all for a while. It wasn’t until I moved to China a few months after graduation, that I cracked open my bible again. 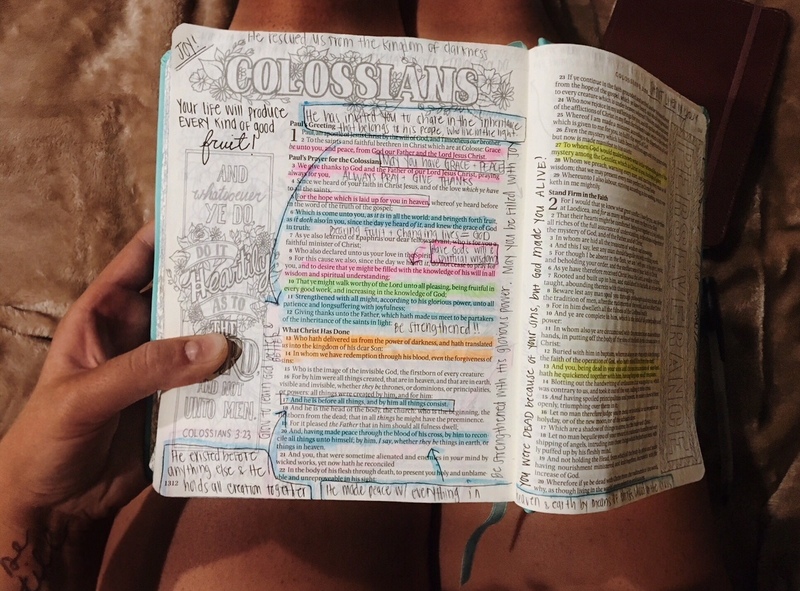 I was homesick and feeling extremely lost living in a foreign country, that I felt all that could help me was scripture. So I started daily devotionals, and they brought me peace, but still I didn’t feel that connection to Him. When I met my last boyfriend, God was everywhere. We met because of a bible scripture. When we were long distance, we prayed together every night. I got a job with a lady who went to their church. I started going to church again and really getting involved with volunteering and I joined a bible study group. I even had a bible study group at work, and we met at lunch to go through bible studies together. And there were just so many other incredible things that had God’s name written all over it, but basically I actually felt God. Through this, I felt His presence. I felt a strong connection with Him. I finally felt like I developed a strong, real relationship with my faith. And now, I read the Bible every day. I do devotionals and bible study plans every day, I read my Christian bloggers, and I talk with friends about faith. Right now, I’m at such a great place with my faith and I owe it all to the hardships I faced. I think sometimes, it takes getting to a really low point to realize the only way to go is up. I was at one of the lowest points of my life and after straying away from my faith, I was pulled back to it in a completely unexpected way that can only be explained by God. One of the things I love so much about religion is that faith aspect: Believing in something without even seeing it. Because if you can believe in that, anything is possible, and so far that’s proven to be true for me and my journey. I love my journey because it’s so uniquely mine, and I can’t wait to see what’s in store for me and my faith.